There are some good things about the internet. We can see, almost in real time, just how crass our MPs really are. We can also, through blogging and various social media platforms, let them know what we think of them. The downside is that they ignore us anyway and carry on regardless, entirely unaffected by what we think of them. Exchanging notes with a certain person though, I received the terse instruction: "do keep at it - the worst is to come". So we do. But this ghastly drama will have to play itself out with us able to do little more than watch and comment until it is over. But comment itself is an activity worth doing. Those people who are gradually eroding our futures must know that we are watching, that we know what they are doing, and that we have long memories. Powerlessness is a state of mind. Power comes with patience: there will always be opportunities for redress. It is just a matter of biding one's time. 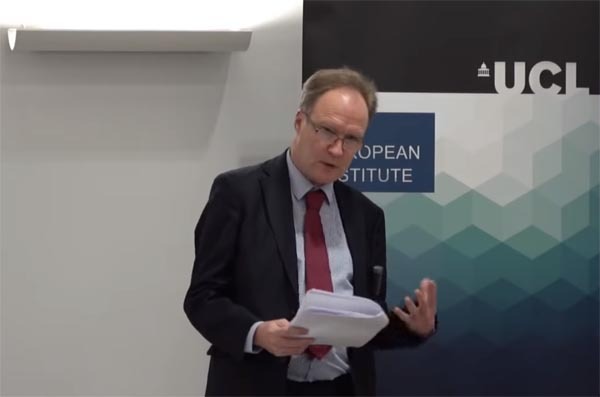 It was perhaps timely, therefore, that yesterday saw Sir Ivan Rogers deliver another of his famous speeches, this one to a packed audience, and in a sombre mood (video here). Turning to his closing comments first, which is an odd way of doing it but it seems apposite, Sir Ivan reminded us that he had said before Christmas: "It is really time to wake up". And I know that reality that as I have understood it and lived it for many years - with my many companions who work so hard on behalf of our public, our politicians and our governments – is cold, boring, and prosaic and peopled by desiccated technocrats who can always come up with some tedious reason why you can’t have all of what you want all of the time. I know that those who have kindly cheered my remarks and comments have been buoyed by the hope that I might be helping to puncture the dreams being peddled by their opponents, and perhaps by the thought they could discern a lurking poetry in the dead hand of my bureaucrat prose. I am not able to do more than throw a bucket of cold water on those who sleep on and on, in the hope that they - finally - wake up and notice that the fire could consume them. In that sense, we're in the same business – trying to bring a sense of reality into this debate – and not being terribly successful at the moment. And if we now rush to the opening of Sir Ivan's long speech, he started by telling us that "we desperately need clear and honest thinking about our choices not just for the weeks but for the years, indeed decades, ahead". "I continue to think", he said, "that our political debate is bedevilled by what, at the time I resigned, I termed 'muddled thinking', and by fantasies and delusions as to what our options really are in the world as it is, as opposed to several different worlds people on different sides of the debate would prefer to inhabit". Nevertheless, it is not going to be possible to capture the real flavour of the speech but, if there is a theme, it's that we're going backwards. Sir Ivan had hoped that the fantasies "would be dissipating by now in the face of reality" but they are "being propagated on all sides". The denialism is pretty universal, but "if we are to take good decisions about our future, it is now genuinely urgent that we get beyond the myth-making". We're in a position where the different factions want different things, with the prime minister offering her TINA (There Is No Alternative) solution against a threat of a no-deal which is not having the desired effect. The EU has never for one minute believed that the UK would go through with it, as it is self-evidently a lot worse – in economic terms - than the deal on offer. Those who don't want a no-deal also don't think any responsible Government will do something so self-evidently self-harming, but are using the possibility as evidence that Brexit is going badly wrong, and may prove a disaster, thereby justifying a new referendum. And those who like the idea of no-deal are using developments to sell the public the proposition that it is perfectly viable and won't be so bad, that it can be "managed". It's a "proper Brexit" unlike the "dog's breakfast" that the prime minister has on offer. None of the players on the extremes, therefore, has reacted in the way the prime minister hoped and expected, while the centrists also do not accept the prime minister's "it's my way or the abyss" contention. They think their options for the future relationship have a better chance than the prime minister of commanding a majority in the Commons. This has brought us to the stage in what amounts to "revolutionary politics" where it is essential for both the revolutionaries and the counterrevolutionaries to extirpate any "compromiser", leaving us with the "bizarre spectacle" of Brexiteers, many of whom used to argue that the Norway or Swiss options would be a vast improvement on remaining in the EU, now dwelling on the "patently absurd" proposition that either would be "a terrible betrayal". An underlying and important truth in this debate is thereby revealed that, as long as we were in the EU, Eurosceptics, "despite the narcissism of small differences", could always hold together. But the moment an attempt was made to define what was wanted from Brexit, as opposed to what Eurosceptics didn't want, unity completely fragments Small differences become large ones. That was the fate of "the most thoughtful sceptic attempts to map an exit route" – embodied in a lengthy tome called Flexcit, "which is a genuine, serious attempt at least to grapple with what insider experts knew were inordinately complex issues". It was spurned by the mainstream Brexiteers, despite some brief dabbling by the likes of Owen Paterson. Says Sir Ivan, Dominic Cummings "shrewdly" deliberately avoided proposing any plan. He "focused the entire campaign on what it didn't want, ensuring that resonated with the maximum number of voters who might find Brexit appealing, but would have radically different ideas of what it would deliver for them. The last thing he, or the political leaders of the campaign, wished to do was to set out a proposed destination, and a route map to reach it". I would omit the word "shrewdly". It was a craven act of political cowardice, running away from the pressing need to show leadership, lancing the boil and coming up with a plan around which the broader Eurosceptic community could and would unite. Instead, the London-centric Tufton Street gang, with their Tory sponsors, hijacked the campaign for their own ends. Either way, with the road running out and under the pressure of simply having to specify where one wants to end and how to get there, the option of "WTO only" - which all serious leave thinkers and politicians had themselves disparaged before the referendum - has now emerged, in various guises, as the preferred option of the hard Brexiteers. As one astute commentator, who voted leave, put it rather superbly this weekend, it is the "I have no solutions and can’t be arsed to think" option. Says Sir Ivan, "it's a gross dereliction of responsibility and a huge failure of leadership, under cover of increasingly empty demagogic rhetoric about betrayal". But as to solutions they advance as better than the horror that they think is the prime minister's proposal, "we still get only vacuities", while a jump to WTO-only freedom of course "makes no sense", particularly from people who say we must leave the EU in order to pursue our sovereign free trade deals with other trade blocs or countries. As for Westminster though, Sir Ivan observes, "we are deep in the Alice in Wonderland world of UK politics", where the vast bulk of the peculiarly antiquated debate about our trading future has been focussed on goods and tariffs issues. We need a far more sophisticated discourse, particularly when it comes to services. But, what is dismal about our political debate is the inability to start that debate until the problems are upon us. What stands out from Sir Ivan in this context is his resort to the blunt language of a frustrated analyst. He speaks, for instance, of the EU, in the event of a no-deal, refusing to share "the latest Brexiteer fantasies" that all we need to do is flout the WTO's Most Favoured Nation principle and carry on according each other preferences and refusing to levy tariffs as if nothing had changed. It is bizarre, he says, "listening to self-styled defenders of the liberal international order even suggest this nonsense". But "no deal" has, let's be honest, become just the latest canvas for Brexiteer dreams. None of what they say has to be true. "It just has to sound compelling and reassuring to people". When we are assured by the former Foreign Secretary that "ample, balanced and pragmatic mini deals" will be prepared in a jiffy once we have just said "no" to the current deal, he knows full well it isn't true. It's just a pale repetition of the same tired old rhetorical tropes we heard from him in 2016, 2017 and 2018. Former Brexit Secretaries and the former Foreign Secretary are accused of "breath-taking" dishonesty and Brexiteers are dismissed as "fantasising about bilateral deals with Dublin", when confronted with the realities of the backstop. At the moment, Sir Ivan concludes, "we have a political class still determined not to look realities in the eye", with a warning that "they will only damage their reputation further with the public if they continue to fail to". And we have very little unity: perhaps less than 30 months ago, "with growing risks to both social and national cohesion. Indeed with a growing risk that the UK will break up". What we need, he says, is "a political discourse that recognises there is no single, perfect answer". There never was, inside or outside the EU. Not a discourse in which all sides play the "everything bar my own version is either a humiliation, a betrayal or a total disaster". And we need a political process which enables the public to see the choices. Or we shall have many bitter years in which we only really hear from the losers as trade-offs – and huge trade-offs are coming - are made untransparently. There is "no leap to freedom" which permanently ends our membership with the EU and it does not pay to be starry-eyed or naïve in negotiating with the EU machine, and for all the belligerent talk and now the fist-waving "no deal" rhetoric, senior Ministers have been both, and have been rolled over repeatedly. This "self-absorbed British political debate" which seems to specialise in outrage about what we absolutely cannot tolerate, but be terribly short of proposals for what we could live with post-Brexit, is not the way to deal with the "difficult negotiating partner" of the EU. And so we finish where we began, with Sir Ivan throwing a bucket of cold water on those who sleep on and on, in the hope that they - finally - wake up and notice that the fire could consume them.